Enjoy your holidays in the lovle built villa in a secluded location with free view of the soft mountains of the alpine upland. Enjoy the panorama at the three-sided window front down to the ground of the living room. Villa Flora is arranged in a modern way and has granite floors with floor heating. The bedrooms have carpet. The comfortable dormer bedroom with a lounge invites you to linger here. A fully equipped kitchen is also awaiting you. The living room leads to a partly roofed over terrace ideal for resting and recreating. In front of the house there is a gravel driveway for several cars. A closed garaged (in the house – winter!) is also present. Left of the property there lies a little creek (attention to children) that holds much snowmelt in winter. The terrific country: The terrific country of Pyhrn-Eisenwurzen with its national park Kalkalpen (wonderful hiking region), many athletic facilities and interesting monasteries, like the Benediktinerstift Kremsmuenster, offers something for everybody. Be it candlelight concerts in music summer Klaus or the famous spa towns of Bad Ischl and Gmunden in the surrounding – already emperor Franz Josef knew, where it is the prettiest. Destinations: The state capital of Linz (approx. 60 km) with Ars Electronic Centre, many churches and galleries --- cultural town Wels with historical old town centre (approx. 50 km) --- Steyr, the town with the Christkindl --- Enns, Ausria’s oldest town with wonderful facades of Baroque and Renaissance --- Bad Hall (with a golf court) with the Tassilo Spa (only 25 km) --- and the salt area with its lakes. Salzburg, the town of Mozart, is only 1 hour drive away. Specialities: Visit us in March or April, when spring arrives and winter leaves, the forest radiates a pleasant calmness and everything has a recreating effect like nothing else. No phone is ringing (we don’t have one), instead a library with about 500 books, from novel to specialised book, is at your command. Narcissus festival: the mainly in the Auseeland appearing narcissus flowers according to the altitude from May to mid June. The large grasslands with its whie/ yellow flowers let the spring of the mountains be an event. You can pick flowers from all grasslands. Absolutely secluded location at the mountain! View of meadows, forests and mountains. All the same it is only 2 bents to the district of Weinzierl and a few minutes drive to shopping facilities. Home service is bookable, e.g. massages, makeup, chiropody, reflexology. This service is also available on Sundays and holidays. Payoff at the location. Rural surrounding. Hiking trails from the property, e.g. to the fort Altpernstein approximately 1 hour. Insgesamt ein schöner Urlaub. Das Haus bietet viel Platz und der nächste Nachbar ist ein paar Hundert Meter weg. Bis zu div. Einkaufsmöglichkeiten ist es eine 5-Min. Fahrt mit dem Auto. Bei starkem Schneefall sollte man das passende Auto dabei haben, da das Haus auf einer Anhöhe über dem Ort liegt und die Strassen steil und kurvig sind. Die Vermieterin gibt einem das Gefühl, sich wie Zuhause zu fühlen, was wir als entgegengebrachtes Vertrauen sehr angenehm empfanden. Leider mussten wir feststellen, dass das Haus, welches auf der Webseite als Nichtraucherdomizil angekündigt worden war, starke Nikotingerüche im Wohn-/Esszimmer aufwies. Die Vermieterin hat auf meine Bitte hin den Eintrag aber mitlerweile geändert. Für Raucher sicher kein Problem - aber wir werden deswegen nicht mehr wiederkommen. Bei dem Preis hätte ich auch erwartet, dass das Mobiliar (z.B. Esszimmerstühle, Sofa) etwas höherwertiger ist. Liebe Frau Schauer, ... eine Oase der Beschaulichkeit. Dass können wir gerne bestätigen, nachdem wir nun schon unseren 4. Sommerurlaub hier verbracht haben. Dieses Jahr meinte es das Wetter mehr als gut - Sonne, Sonne, Sonne! Einige Wanderungen haben wir trotzdem unternommen. Ein wunderschönes Haus sehr ruhig und schön gelegen. Es stimmt in diesem Haus einfach alles, die Einrichtung und Ausstattung genügt dem gehobenen Anspruch. Besonders zu erwähnen ist die Liebe zum Detail und die sehr komplette Ausstattung an Bedarfsgegenständen. Man braucht wirklich fast nichts mitzunehmen. Micheldorf close to the district capital Kirchdorf is a small, idyllic village. The village emblem is the fort Altpernstein and the Georgiberg mountain with the Georgikirchlein church. 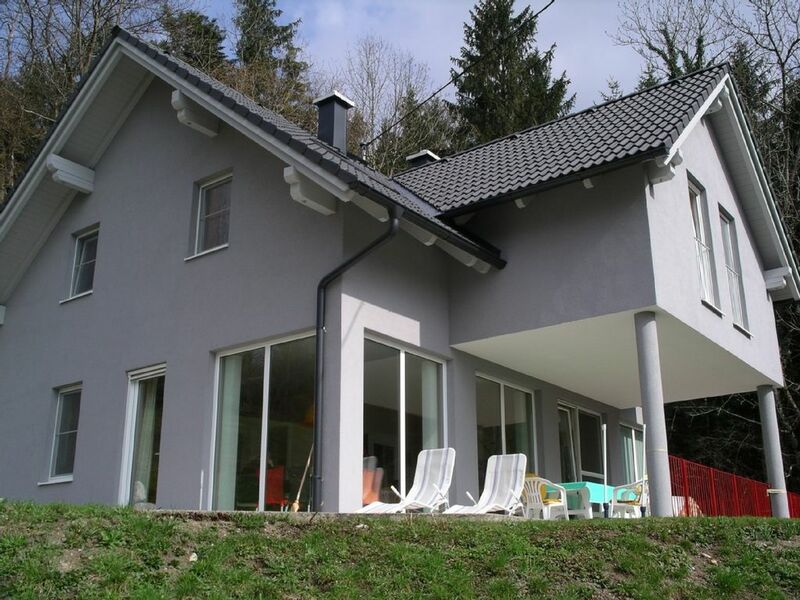 The district of Weinzierl has developed up the mountain and the Villa Flora gives it a modern touch. The area of Pyhrn-Eisenwurzen is famous for eastern sing. A typical local beverage is the ‘Most’, similar to the French Cidre. Paragliding centre in the area. Golf: 27 golf complexes within Upper Austria! Golfclub Pyhrn-Priel: 18-whole/Par 71, greenfee € 55 - 60, 32 km from Villa Flora, 20 min drive. Golfclub Herzog Tassilo, Bad Hall: 18-whole/Par 70, greenfee € 30 - 50, 20 km from Villa Flora, 30 min drive. Golf Resort Kremstal:18-whole/Par 72, greenfee € 40 - 60, 27 km from Villa Flora, 30 min drive. Golfclub Traunsee Kirchham: 19-whole/Par 70, greenfee € 45 - 55, 23 km von Villa Flora, 30 min. drive Golfclub Wels: 18-whole/Par 72, greenfee € 50 - 60, 33 km from Villa Flora, 40 min. drive. Ski: Pyhrn Priel. This is where winter dreams become true. Four villages take part in it. Hinterstoder (world cup experience, 2 ski areas from blue to black, 6er cabinet lift, 3 double chairlifts, 7 cable lifts, 22 km ski-runs). Vorderstoder (1 double chairlift, 2 cable lifts, snowing complexes including cross-country ski runs). Windischgarstener Tal (Hutterer Hoess, Wurzeralm and 60 km of cross-country ski runs, biathlon world cup). Spital am Pyhrn (family friendly, cablecar, double chair lift up to 1886 metres, 50 km cross-country ski runs on three levels). Ski region 20 - 40 minute drive.